Don't grab the shovel or sled just yet. Snow in April here in the Garden State is not unusual. Although it's probably fair to call it unwelcome after the very active and cold winter we endured. 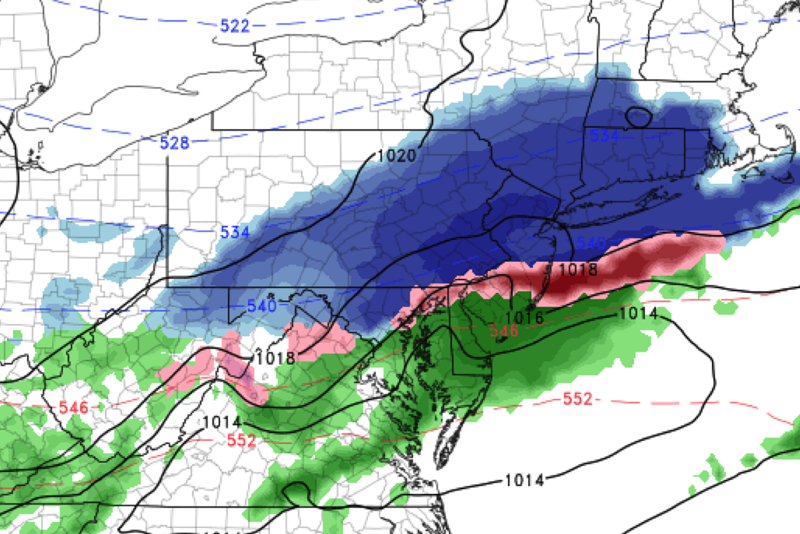 As I started mentioning on the radio and in my weather blog on Friday, a quick hit of snow is possible for most of New Jersey on Monday morning. I think we've sufficiently resolved questions regarding this system's track, timing, intensity, and temperatures to issue a forecast with moderate confidence. Looking for big snow? Look somewhere else. A compact, fast-moving storm system will arrive in the Garden State on Monday morning, dropping upwards of an inch or two of snow (especially on cold non-paved surfaces). Pockets of heavy snow and/or wintry mix may lead to reduced visibility. With high temperatures in the 40s and afternoon sunshine, any snow that does fall and accumulate will not last long. Note: My usual snow map rule applies here. To avoid unnecessary hype and hysteria, I do not create snowfall forecast maps for a winter weather event unless it is expected to bring widespread 2+ inch snow totals. Thus, no map for this one. First flakes are expected early Monday morning, between about 2 a.m. and 5 a.m. This overnight arrival is a very important element to this forecast, as overnight temperatures will be (just barely) cold enough to sustain all wintry precipitation (i.e. snow). The storm should exit the Garden State by midday Monday, between about 11 a.m. and 2 p.m. at the latest. We'll likely experience a switch to wintry mix and/or rain as temperatures warm after sunrise on Monday. The latest model roundup shows up to 8" of snow according to the NAM, up to 4" according to the Euro, and up to 3" according to the GFS. Wow, 8 inches would be some impressive late-season snow! OK, let's take that 8" snowfall estimate and assume it's actually viable for a moment (hint: it's not) as we consider some important limiting factors. First, the snow ratio will be low. Model estimates are usually based on a flat estimate of the snow ratio of 10:1. (Meaning if you melt 10 inches of snow, you'd get 1 inch of water.) When temperatures are warmer (close to the freezing mark) that ratio is generally considerably lower, closer to 6:1. Second, it's a short window for big snow. QPF (total liquid precipitation forecast) is on the order of 0.6" max. And there's only going to be 9 hours of accumulation time (give or take). So we'd have to see all snow pouring from the sky at an inch an hour to reach 8", with no mixing. It's not going to be that heavy, and there will most certainly be pockets of snow/sleet/rain mix. Each of these limiting factors each will have the effect of cutting snow totals approximately in half. 8" to 4". 4" to 2". 2" to 1". That's it. Let's call it an inch or two of accumulation, at the most. So much for impressive major snow, eh? Hopefully by now, you've realized that I'm downplaying the potential for anything remotely resembling crippling, significant snowfall. However, as we know, it only takes a few snowflakes to completely snarl traffic and transit across the region. The timing is especially important once again. With the heaviest snow potentially falling during Monday morning's rush hour, it could easily make for low visibility and icy/slushy/wet road conditions as New Jerseyans flock to the roads. Sure, an inch or two of snow really isn't a big deal. No bread and milk necessary this time around. But it's still important to take it seriously — consider leaving yourself a few extra minutes of travel time on Monday morning to clear off your car and ensure a safe, slow drive. By the evening commute on Monday, most of the snow will have melted away. No further travel issues are expected, aside from a potential refreeze Monday night to Tuesday morning. By the way, this is a clipper system with no coastal component. No wind or surf concerns are anticipated. Many schools are on Spring Break this week, but I suppose districts that are in session could consider a delayed opening or even a closing on Monday. This will almost certainly be a last-minute decision, not a night-before kind of thing. Enough already, Mother Nature. We want Spring!